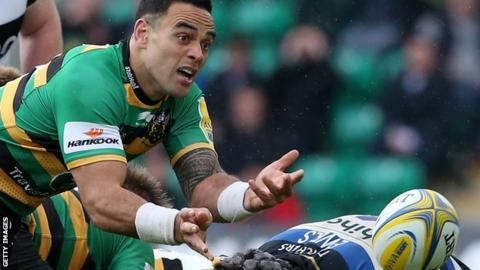 Bath are to sign Northampton Saints' Kahn Fotuali'i, head coach Mike Ford has revealed to BBC Radio Bristol. Ford said that the signing of Fotuali'i will add experience to his side. "We've got some great youngsters but we're going to get that experience, Luke Charteris in, (Taulupe) Faletua in and Kahn Fotuali'i in," he continued. "That's the experience that we need." Bath finished the Premiership season in ninth place following a 38-27 win over Leicester on Saturday in their final game. Fotuali'i told BBC Radio Northampton: "I've enjoyed my time here. I'm sad to be leaving a big club. "I've got another big challenge in front of me and I'm pretty excited about it." Last week it was confirmed that South African scrum-half Nic Groom will join Northampton from Super Rugby side Stormers ahead of next season.